Bear attacks are on the rise, and changes in the environment are to blame. There are three factors making it more likely that you'll get a bear claw in the face. Yellowstone is known for its close encounters with bears. Local park bears have learned to break into cars, they've pushed their cubs into trees to retrieve food stored in bags off the ground, and they've cracked open bear boxes - specially designed canisters meant to seal food away from the reach of bears. For the most part, though, they left the people themselves alone. Recently, encounters with bears have been on the rise, even outside of the park. These encounters end badly for everyone. In 2010, 75 grizzly bears were either shot or taken out of the park following a record number of aggressive encounters with humans, and two mauling deaths. It isn't that the bear population is increasing, it's that their food supply is decreasing, even in a massive national park. 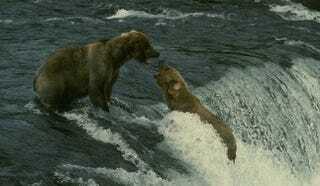 Three major environmental kinks are being put in the bear's food supply. Two are from nonnative species. A new kind of trout is cruising the waters of Yellowstone, and it eats the trout that would be the bear's food supply while staying in the deep end of the lakes, where the bear can't reach it. Meanwhile blister rust is killing the pine trees, reducing the number of pine nuts the bears can eat. Meanwhile, warming climates are bringing a beetle species down from the mountains, that's also eating its way through the pines. There are about 600-700 bears in all of Yellowstone, so the population is not robust. Any strain could have dire consequences. And sharp teeth.